13 October 2016 – On 13 June 2016, Bahraini forces surrounded the house of human rights defender Nabeel Rajab and arrested him. At the time of his arrest, authorities had not yet informed Rajab, his family, or his legal team the reason for detaining him. However, the government has since issued charges against Rajab that accuse him of spreading false news “in a time of war,” insulting the Government of Saudi Arabia, and criticizing a government body. The charges for which Government of Bahrain has arrested Rajab are attributed to comments made in tweets from 2014 and 2015. 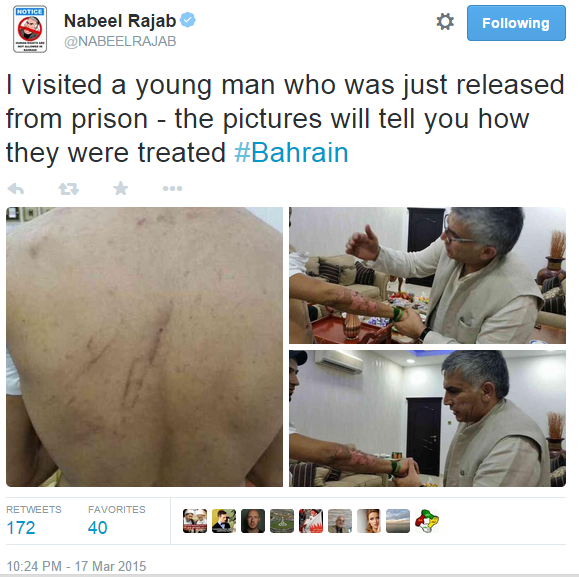 One of the tweets for which Rajab is detained documents torture in Bahrain’s Jau Prison. In March 2015, Rajab visited with a victim who had recently been released from the prison. The pictures tweeted out show burn marks and scars from beatings. Additionally, Bahraini authorities arrested Rajab for another tweet that criticized the Saudi-led war in Yemen, which has caused a massive humanitarian crisis. For documenting these issues, the Bahraini government first arrested Rajab in April 2015. Authorities detained Rajab for a number of months until he was releasedin July 2015 for medical reasons. Though out of prison, the government issued a travel ban against him to prevent Rajab from doing his work promoting human rights abroad. From July 2015 to June 2016, while under travel ban, Rajab was at risk of rearrest. Prior to his arrest in 2015, Bahraini authorities had also sentenced Rajab for commenting on an incident regarding security forces in the country. In 2014, a man who had served in the Bahraini security forces left the country to join Daesh. 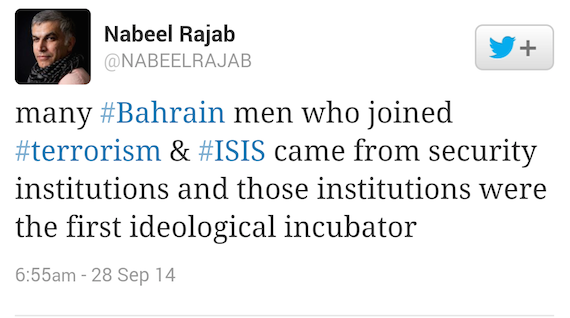 In September 2014, Rajab noted that the way the Bahraini government runs its security forces serves as an “ideological incubator” for terrorism. The Bahraini security forces are made up almost exclusively from Sunni individuals, despite the fact that Bahrain is a Shia-majority country. In order to maintain the number of security force workers the government requires, Bahraini officials bring i n foreign-born Sunni individuals from countries such as Jordan, Pakistan, and Yemen and naturalize them as Bahraini citizens. Meanwhile, more than 300 Bahraini citizens have been denaturalized and some deported for their political beliefs. These security forces have a long history of using excessive forceand weaponizing tear gas, rubber bullets, and other crowd-control weaponry to suppress civilian populations. The charges for which Rajab is detained do not align with the Bahraini government’s commitments under the International Covenant on Civil and Political Rights (ICCPR), a treaty to which the government acceded to in 2006. Under Article 19 of the ICCPR, “Everyone shall have the right to freedom of expression; this right shall include freedom to seek, receive and impart information and ideas of all kinds through any other media of his choice.” Additionally, under Article 19 of the Universal Declaration of Human Rights (UDHR), “Everyone has the right to freedom of opinion and expression; this right includes freedom to hold opinions without interference and to seek, receive and impart information and ideas through any media and regardless of frontiers.” By arresting and charging Nabeel Rajab for tweets, the Bahraini government criminalizes peaceful dissent, closing the space for Bahrainis to exercise their internationally-sanctioned rights to freedom of expression.